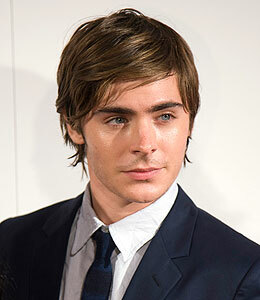 "High School Musical" heartthrob Zac Efron has reportedly been attacked by a deranged fan! The blue-eyed Disney star is constantly surrounded by a gaggle of screaming tween girls -- but this time, it was an older man who attempted to get his attention! As the heartthrob left London's Apollo Theatre with GF Vanessa Hudgens, "some guy just stood near the door where Zac and Vanessa emerged," an onlooker tells London's Daily Mail. "He just reached over and grabbed the side of Zac's head. There was no provocation. It all turned into a bit of a mess." The witness said the man -- thought to be a fan -- shouted at Efron before his security team got him safely into a car. Last year, Zac told "Extra" that he preferred being mobbed by his younger fans, saying, "It's better than having, like, crazy, mid-30 year-old male fans!" The two "HSM" stars were reportedly uninjured -- and the alleged incident was not reported to police.